Bertie’s Buccaneers is a fundraising community and in particular a Family Fund for Muscular Dystrophy UK. Family Funds like ours together raise vital funds for groundbreaking research into Bertie’s condition. We are currently awaiting the final report on Prof. Muntoni’s recent project. Prof. Muntoni is now one of Bertie’s consultants at Great Ormond Street. Ullrich muscular dystrophy is caused by a lack of collagen VI protein, which acts as a scaffold to hold and support muscle cells. Studies have shown that one functional copy of the gene is able to produce sufficient collagen VI protein to build an effective scaffold. Professor Muntoni aims to develop techniques to switch off or ‘silence’ a gene with a dominant mutation, to allow the second, healthy copy of the gene, to function normally. You can help us fund project like this by joining our Bertie’s Buccaneers ‘Team Bertie’ and signing up for an MDUK-sponsored event or by creating your own. In this project, two methods of ‘silencing’ the gene will be tested: exon skipping and a new technique called RNA interference. Both use small molecules called oligonucleotides to prevent the mutated copy of the gene producing protein and have shown potential as a therapy for other conditions. These approaches will be tested in skin cells taken from people with Ullrich congenital muscular dystrophy and grown in the laboratory. The researchers will apply oligonucleotides to the cells and check whether this stops the mutated copy of the gene producing protein. 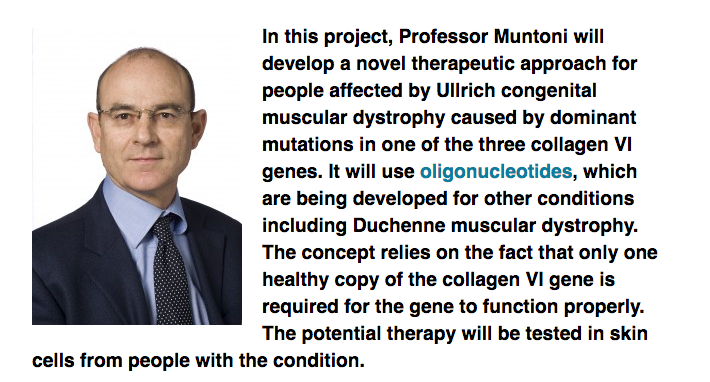 They will also investigate whether the techniques result in functional collagen VI being produced – something that could represent a therapeutic approach for Ullrich congenital muscular dystrophy. Posted in Donations, Researching a cure and tagged Bertie's Buccaneers, Professor Muntoni.